The first thing you notice about the Switch, Nintendo’s sleek new portable console, is how small the controllers are. 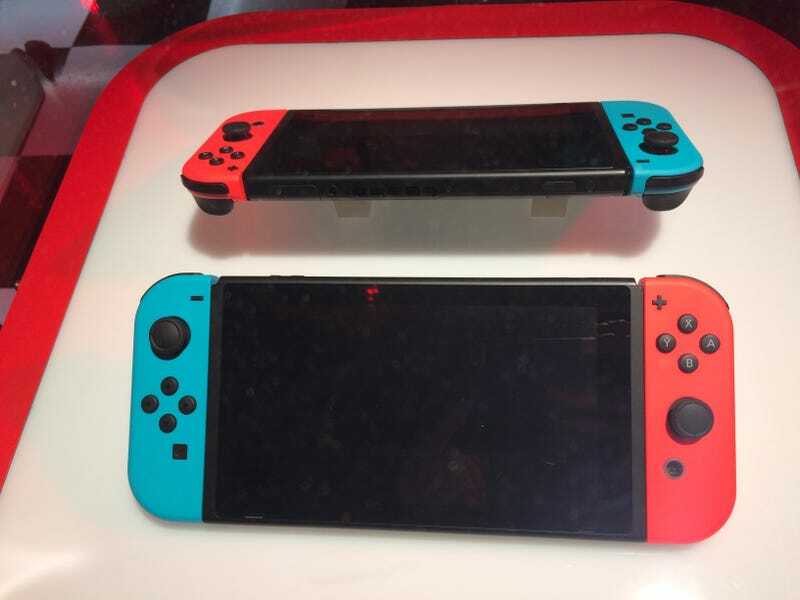 Each JoyCon (lol) is roughly four inches, or about the size of a Kotaku news editor’s palm. Compared to, say, the Wiimote, they’re downright tiny. Yet they’re also surprisingly comfortable, not just when you stick them in the dog-eared JoyCon Grip but when you hold them separately, Wiimote and Nunchuk style. Holding a single JoyCon horizontally, which is Nintendo’s recommended way to play several games (and the only way to play local co-op without a second set of controllers), is far less comfy. It’s too small to hold with two hands for an extended period of time. But in other configurations, the JoyCons feel great. This morning in Manhattan, Nintendo held a Switch hands-on event, allowing journalists to get their fingers all over the new console. The list of games in attendance was sparse—not shocking for a console launch—and included some old games like Skylanders: Imaginators and Disgaea 5. I played Splatoon 2, which is basically Splatoon with new weapons. I got my hands on Super Bomberman R, which seems very much like a remake (or re-envisioning) of Super Bomberman on SNES. (Who would’ve thought that Konami still makes video games?) The bizarre game Arms is reminiscent of a Wii boxing game—the demo attendants even made sure we put on our wrist straps!—and seems like it’ll be fun for a few minutes before it gets old. Switching between the TV and the portable is a smooth process. When you pull the Switch out of its dock, your game will appear on the portable almost immediately. When you put it back in, it takes no more than 2-3 seconds for the image to display on your television. It’s very easy to snap the JoyCons on and off the sides of the Switch system. It’s also very easy to snap them on and off the Grip controller. Each JoyCon has a button you have to hold to detach it from something, and it all works nicely, even if this thing is just begging for you to lose one of your controllers under the couch. Playing with the JoyCons held separately feels a lot like playing on a Wiimote and Nunchuk, as I mentioned earlier. This is a very good thing. There’s something oddly relaxing about holding your hands in different positions as you play through a game as vast as Zelda. Playing with the JoyCons on the Grip feels great, like you’re holding a standard controller. This is going to be the ideal way to play most games: In fact, Zelda will tell you by way of a message on the bottom screen that it recommends you play with both JoyCons attached to the Grip controller. I can’t believe I have to keep writing the word JoyCon.